Statement: The Total Product Concept is made up of the Product Considerations, the Product Layers and the Product Components and is one of the three marketing mega-concepts of this unit. Explain the Product Layers [including appropriate examples]. Also provide a summary of the Product Components concept, then select three of its components and explain them using appropriate examples. 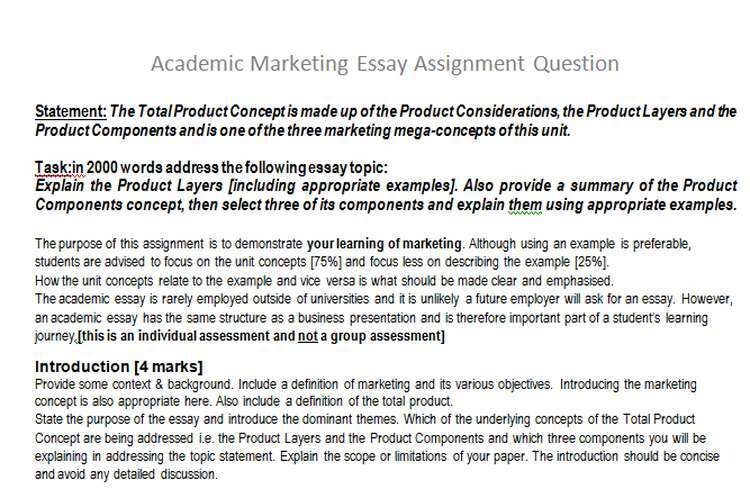 The purpose of this assignment is to demonstrate your learning of marketing analysis. Although using an example is preferable, students are advised to focus on the unit concepts [75%] and focus less on describing the example [25%].How the unit concepts relate to the example and vice versa is what should be made clear and emphasised. Provide some context & background. Include a definition of marketing and its various objectives. Introducing the marketing concept is also appropriate here. Also include a definition of the total product. State the purpose of the essay and introduce the dominant themes. Which of the underlying concepts of the Total Product Concept are being addressed i.e. the Product Layers and the Product Components and which three components you will be explaining in addressing the topic statement. Explain the scope or limitations of your paper. The introduction should be concise and avoid any detailed discussion. This should involve a logical explanation of the Product Layers concept from this unit, including appropriate examples. Next give an overall summary of the Product Components concept from this unit. Having provided this brief explanation of the Product Components concept it is now appropriate that you introduce and explain three of its components [you select which three] -this needs to be done in some detail. Where possible, use examples to illustrate the points you have made – if they are your own examples rather than those utilised in class all the better. This may take some thought and analysis. The first places to look as reference sources for the above are the relevant chapters of the e-book The Marketing Concept 2016 and lecture slides relevant to the concepts. Whilst in-text referencing is required throughout your work, in this section you will often be in-text referencing the e-book The Marketing Concept 2016 as well as some of the key journal articles beyond this. This should draw together all the main points you have made in your discussion. It should link your presented information and provide conclusions. No new material should be introduced here. All references cited in-text in your essay should be listed in full at the end of the assignment in the end text reference list. You should also not have any source material in your end-text reference list which is not included as an in-text reference within the text of the essay. This reference list MUST be included in your turnitin assessment submission.